A Nigerian man identified as Mr. Pius Edobor from Uromi in Edo State , reportedly absconded from home since his wife Mrs. Ugonma Edobor gave birth to triplets on December 29th, 2017. 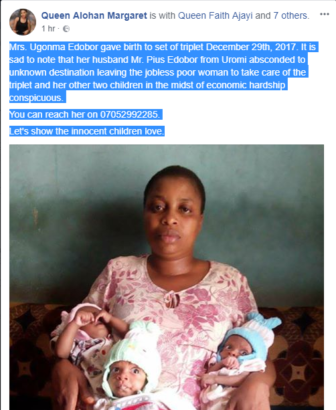 Mrs. Ugonma Edobor gave birth to set of triplet December 29th, 2017. 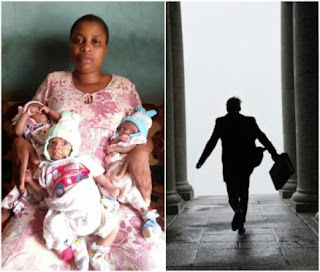 It is sad to note that her husband Mr. Pius Edobor from Uromi absconded to unknown destination leaving the jobless poor woman to take care of the triplet and her other two children in the midst of economic hardship conspicuous. You can reach her on 07052992285. Let’s show the innocent children love. All of this is coming after it was reported that a Nigerian man, also ran away from home four months ago after his pregnant wife’s scan revealed that they will be welcoming triplets.